When we sold our home in Colorado and moved to Oregon, I didn't expect to live in an apartment. I mean, what is a woman with a cottage blog doing living in an apartment? 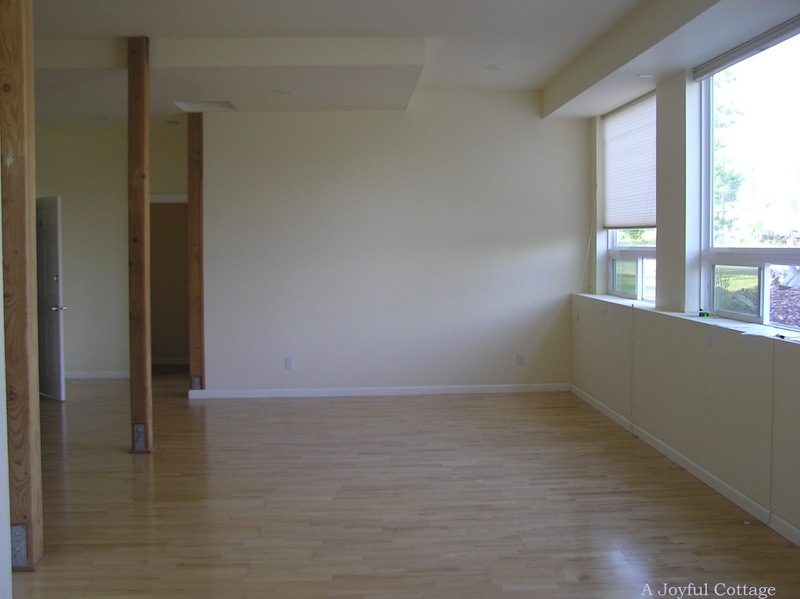 Well, for now this is where God has us, and so I'm trying to be content with that and make this contemporary apartment. . .
feel more like this cozy cottage. . . Challenging, huh? Especially when I'm doing it on a self-imposed budget. Well, baby steps, as they say. One of the blessings of living here is having my own personal space -- a 12' x 15' second bedroom -- in which to create (something I didn't have in our previous 640 SF, 1 bedroom cottage). It's still a work in progress, but I have made some strides. In September I showed you my "desk" -- a vintage table makeover. Today I want to show you another project I completed for my space. Here you see it with some of the other yard sale finds Dennis brought home. He picked up this little honey for $15. Yeah, pretty amazing deal. This piece probably began life as a kitchen cupboard. 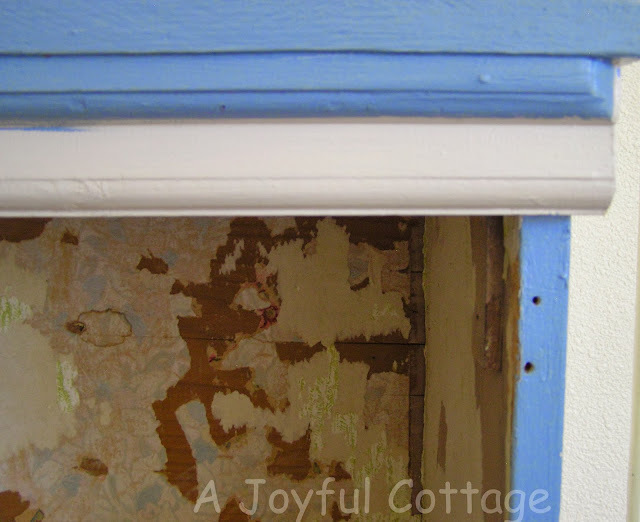 At some point crooked plywood shelves were added, and it was painted white with a blue trim. Layers of contact paper and wallpaper covered the interior. I discovered this vintage floral wallpaper. 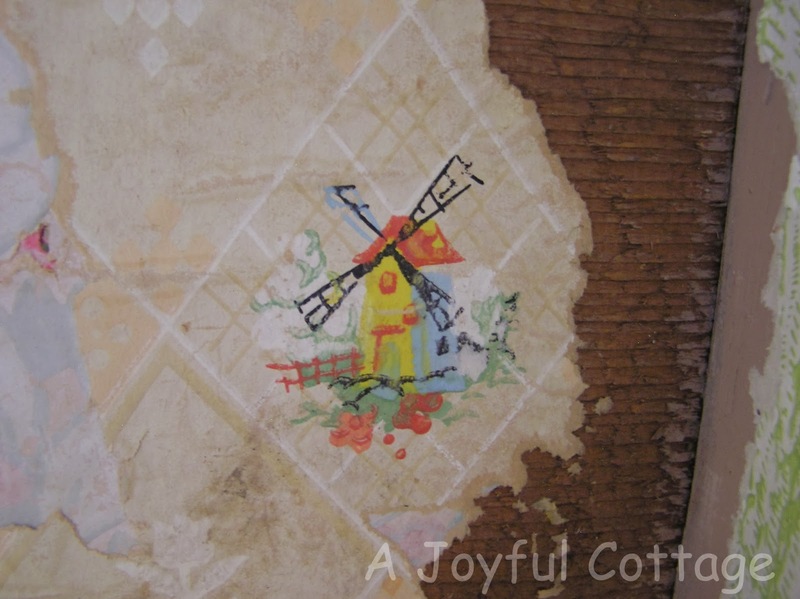 . .
and this vintage windmill wallpaper. 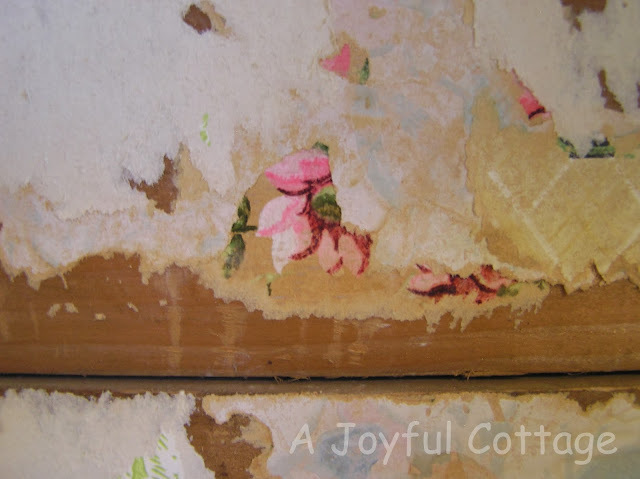 And because somebody decades ago went to all that trouble to prettify their little cupboard with real wallpaper, and because I'm a sentimental push over for things like that, I stopped. The interior remains delightfully shabby. Dennis made new pine shelves, and spaced them so I have more room for books. The new shelves are nice and straight, too. I decided not to paint them for now. Maybe later I will. Maybe not. and my born again bookcase was good to go. Now I have a place for all my books. Other things that make me smile rest on top. And our apartment feels just a little more like the cottage I dream about. Thanks so much for visiting. I hope your week is off to a joyful start. 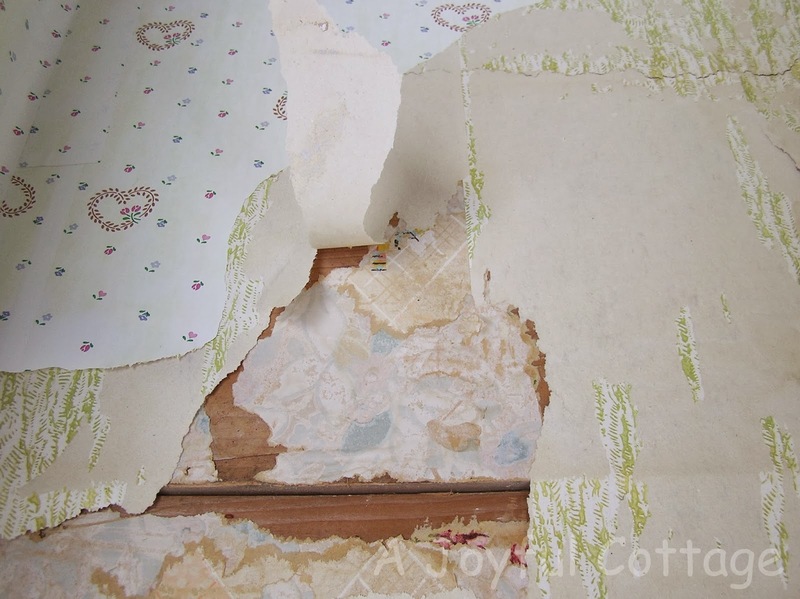 Nancy, I love that you left the scraps of wallpaper in the cupboard. There's something infinitely sweet about it! Definitely cottage! I agree with Kim, above, so glad you left bits of the wallpaper. So many layers, and that sweet windmill paper! 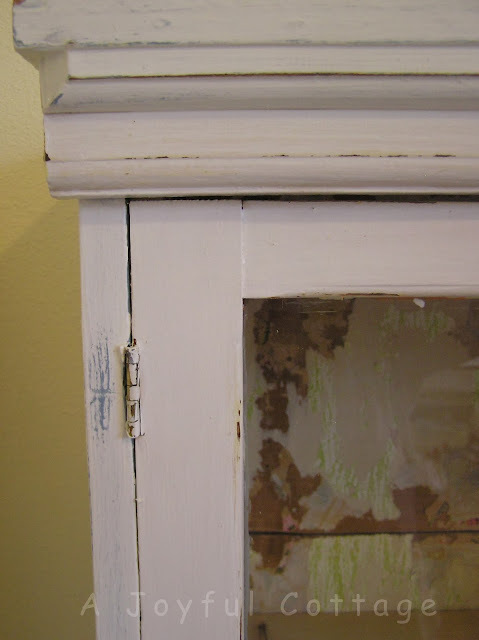 The cabinet was a good find and you have made it lovely. 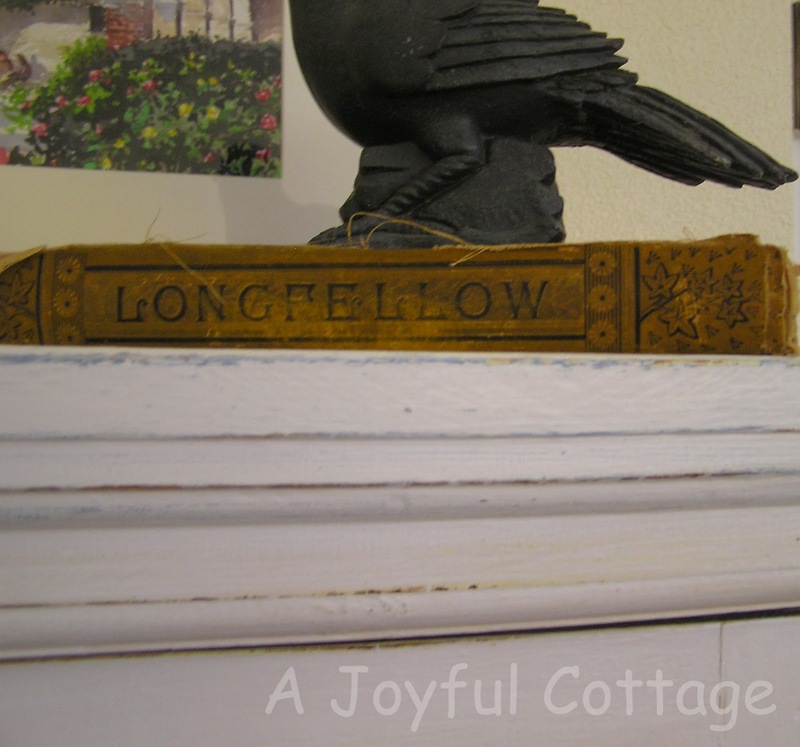 The cottage you showed a picture of is beautiful--what a fireplace! But yours will be lovely too, one step at a time. Will there be another cottage for you in the future? Another cottage in the future? Oh, I hope so, Dewena. If we can find one in our price range. I think that you are doing an amazing job making an apartment look just like a wonderful cottage. And you are making it look pretty easy too. What an adorable book shelf you have made this. and the room... it looks amazing. I like that, too, Rose! Books tell so much about a person, don't they? Wow! so many layers of wallpaper. I do like that you left the scrapes of stuck paper to the inside. Very nice Nancy . . . 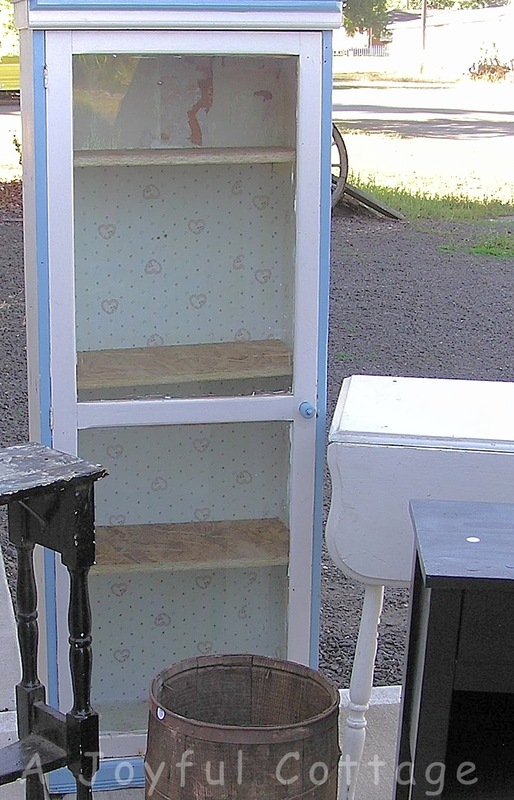 It must be the best feeling ever to have a clean slate, start over, space and time to bring a small, little cupboard like bookcase back to life! Very, very nice! I like the wallpaper left on the back board. It is a good feeling, Lynne. Having my own private space is a wonderful change. Loved the way you renewed your bookcase so much that I read all the way back to October 1st. What a wonderful buy your #1 Picker made for you. I am following and will put your blog on my bloglist so I remember to visit again to see what you worked on next. Thank you for visiting me today too. 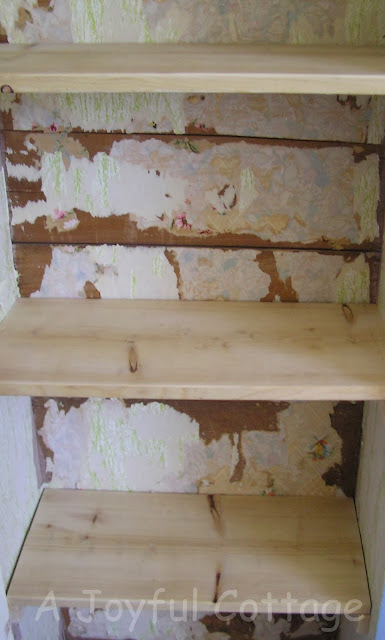 I love your bookcase and the amount of work you put into it. When we first moved to our little cottage, we had no room for bookcases and all of our books were stored in the garage. We are book lovers and I felt like our house did not reflect our personalities. 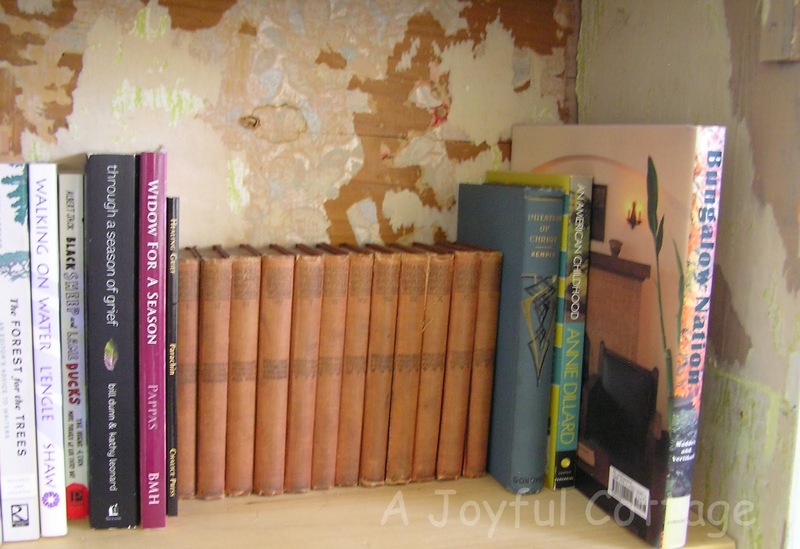 I was so glad when we could gradually buy furniture to show off our books. 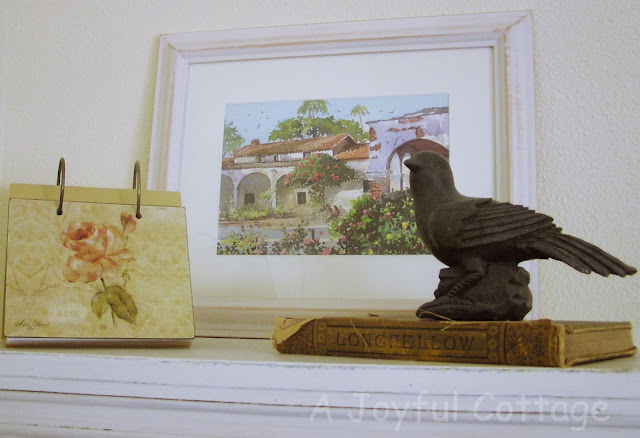 Your decorating might be slow and on a budget, but much more meaningful than some of my friends who hire a decorator and have it done in 3 months. love this, nancy! 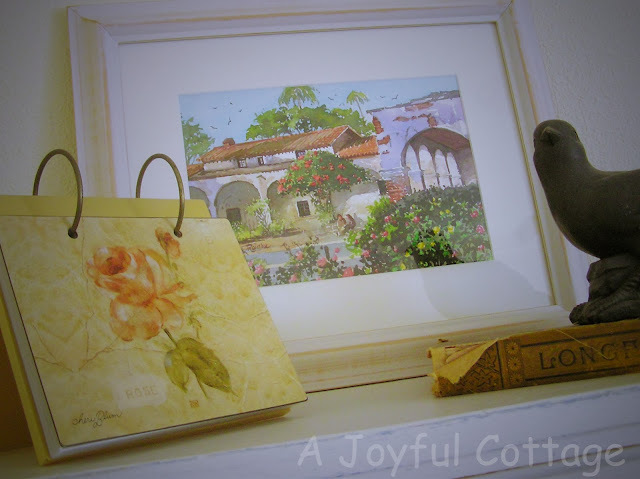 i've seen walls with wallpaper bits on them and it's always wowed me:) great job! LOVE your bookcase! You have a beautiful blog! You're so nice. Thank you, Monica. I love that you left the layers of wallpaper. What a treasure! Thanks Jeannie Marie. It's been fun to see how many people like the wallpaper remnants. I felt it was so much a part of the cupboard, its history, that it would have been wrong to remove it. Thank you for visiting and commenting. Much appreciated. What a fabulous find! And I love that you left the back of it with all of the vintage paper. Your books look so pretty with that background. Very nice! Holy cow that guy needed some TLC and you did a great job! I probably would have just kept tearing away the paper but leaving it was so very much the right decision! Thanks, Allison. I have to admit I did think about removing it all, but now I'm glad I didn't. Nancy, that piece is a little treasure. 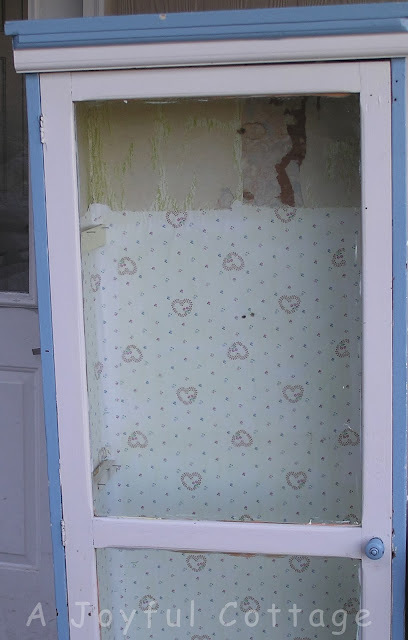 I love how you left the remnants of the vintage wallpaper. I sentimental like that too. So much better than the hearts. And yes, I do remember. lol! Great job on the painting. I like the bits of blue showing. Looks like a cottage to me my friend. Thanks for sharing with SYC. You have made a wonderful transformation in that contemporary apartment. I just LOVE it! I also love what you did with the bookcase. Leaving the traces of the past adds such a personal touch. It's wonderful! Hope you are having a great Sunday, and thanks for sharing with Sunday View. My pleasure, Laura. Thanks for hosting, and for taking the time to personally visit. Much appreciated. Have a great week. Thanks, Kathy. And thanks for hosting Home and Garden Thursday.